Our journey through the Easter season leads us to the celebration of Pentecost. Following his resurrection, Jesus instructed his disciples to stay where they were until they had received the Holy Spirit. I have often reflected on the wind and the breath of the Spirit as I prepared for Pentecost, but this year my focus shifted to the reference in the Scripture to the flames. Remembering flames in the fireplace this long winter reminded me of how steady and unpredictable they seem. In one sense, they are steady as they burn and, in another sense, they seem unpredictable in their ebb and flow, rising and falling. Fire is an interesting topic in Scripture. Fire is used in two ways that are in sharp contrast. On one hand, fire is a sign of God’s judgment, wrath and a means of purification. On the other hand, fire is a sign of God’s power and presence. 1. God spoke to Moses through a burning bush. 2. Israel was led through the wilderness by a pillar of cloud and fire. 3. God answered the prayers of Elijah with fire on Mount Carmel. 4. The sacrifices in the temple were consumed by fire. 5. The smoke from the burning incense filled the holiest places in the temple. 6. God tells Jeremiah that his Word is like fire. 7. John says Jesus will baptize us with the Holy Spirit and with fire. 8. Jesus says everyone will be salted with fire. 9. Paul says fire will test every believer’s work. 10. Paul also says that Jesus will come with blazing fire. 11. James says a spark or small flame will start a forest fire. 12. Revelation reminds us that God’s eyes are like blazing fires. Perhaps my favorite story involving fire, beyond Pentecost, is the story of Shadrach, Meshach and Abednego, who refused to bow down before the idols of a king. Because of their faith they found themselves in a burning fiery furnace. Reflecting on the meaning of that story one pastor wrote, “The people of God are in harmony with the will of God only when they are willing to burn for what they believe.” Faith with power will always be singed with the fire of the Holy Spirit. The events of Pentecost are recorded in Acts 2, and by Chapter 3 some of the disciples are already in jail because of their fiery faith. In Luke 12:49, Jesus says, “I have come to bring fire on the earth, and how I wish it were already kindled!” His goal was to burn away that which needed to be destroyed so that the fire of the presence of God might be clearly revealed. Perhaps Jesus is suggesting in those words that he came to set us on fire. When you think of your congregation compared to the Church on Pentecost, would you say that your congregation is “on fire” with the Spirit or “under fire” from conflicts within and pressure from the world without? Some believe the Church has lost its fire. As it has grown in institutional strength it has become weaker spiritually. I believe that I cannot by my own reason or strength believe in Jesus Christ, my Lord, or come to him; but the Holy Spirit has called me by the Gospel, enlightened me with his gifts, sanctified and kept me in the true faith. In the same way he calls, gathers, enlightens, and sanctifies the whole Christian Church on earth, and keeps it with Jesus Christ in the one true faith. In this Christian Church he daily and richly forgives all my sins and the sins of all believers. On the Last Day he will raise me and all the dead and give eternal life to me and all believers in Christ. This is most certainly true. The Church can do nothing apart from the Holy Spirit. From without and from within the Holy Spirit is alive and at work. Perhaps the greater issue is our awareness and willingness to grow and mature in all that it means to be called, enlightened and sanctified in the one true faith in Jesus Christ as individuals, congregations and the Body of Christ. This same Holy Spirit will transform our ministry. We will become fearless in sharing our faith in Jesus Christ with others even if it causes them to question their own beliefs. We will search for spiritual solutions to care for others, praying with them, anointing them, asking Christ for discernment, direction and knowledge about their problems so he can use us for greater healing in their lives. Perhaps we will become less resistant to the reality of miracles, healing, signs and wonders and trust in the Holy Spirit to act with power as it is described in the book of Acts. Our world is not so different from the context of Pentecost. It was just as immoral, pagan and selfcentered as our own culture. The world needs more from the Body of Christ than a word of affirmation for its values of tolerance and acceptance. Morality has been replaced with sexual confusion. Family is anyone who cares. Love and selfishness seem inseparable. The longing for meaningful relationships through social media leave many more empty than fulfilled. Fear of the future is manifest in the epidemic levels of drug addiction, depression and suicide rates among our children. The world needs what only Christ can bring — redemption and salvation. We know the disciples of Jesus made a profound difference in the culture following Pentecost. We must ask how the Body of Christ is making a difference in this culture? If what we are doing isn’t working, what should we do? Jesus said, set it on fire! If you want the church to have power, Jesus said, set it on fire! If you want the church to be what Jesus intended it to be, Jesus said, set it on fire! I am convinced that the Holy Spirit is still accessible and ready to bring that fire, but fire cannot take place when it is an environment that is hostile to combustion. 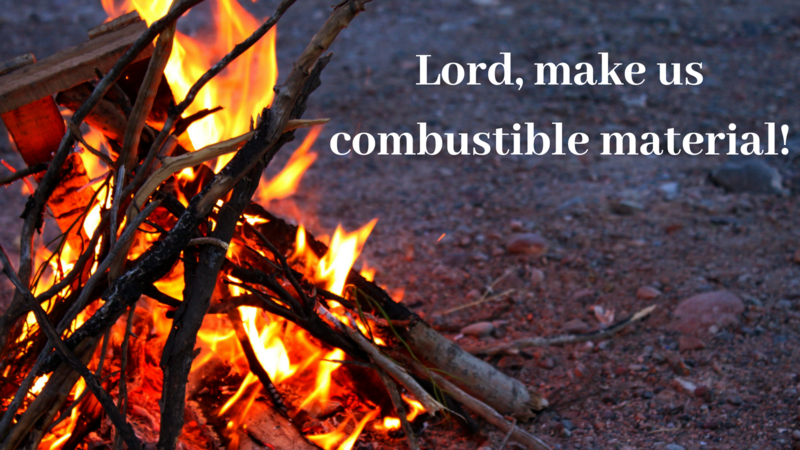 How do we become combustible material so that our lives bear both the light and heat of the Holy Spirit? 3. Grew from 12 to 120 people. 4. Were confident in the truth of the Gospel. 5. Were convinced of God’s presence. 6. Their hearts became obedient. 7. Their focus shifted from self-preservation to mission. Their prayer time together produced both inner peace and boldness making them combustible material. Whenever fire breaks out, it is hard to keep it in one place. It’s contagious. Those men and women who first composed the Church found themselves going everywhere telling others about Jesus. Difficulties disappeared, individual goals disintegrated when they took their eyes off of themselves and made Jesus their focus. Problems became possibilities and stumbling blocks became stepping stones and what they thought was defeat became their greatest victory. Set the Church on fire! This fire of light and truth can change the world. This fire has transformed the lives of individuals and nations. It will replace falsehood with truth. This fire can warm our hard hearts and make them pulse with the passion of Christian love, offering strength to the weak, hope to the hopeless, power to the powerless and love to the loveless. It is the only power we have, and it is all we need. It is my prayer that you experience that same fire in your life and in your congregation this Pentecost and each day, following Christ Jesus. It is good to be with you following him.